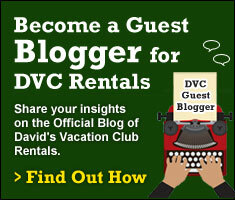 A few weeks ago I asked our followers on facebook to help me choose which Disney Vacation Club restaurant I would eat dinner at that night. 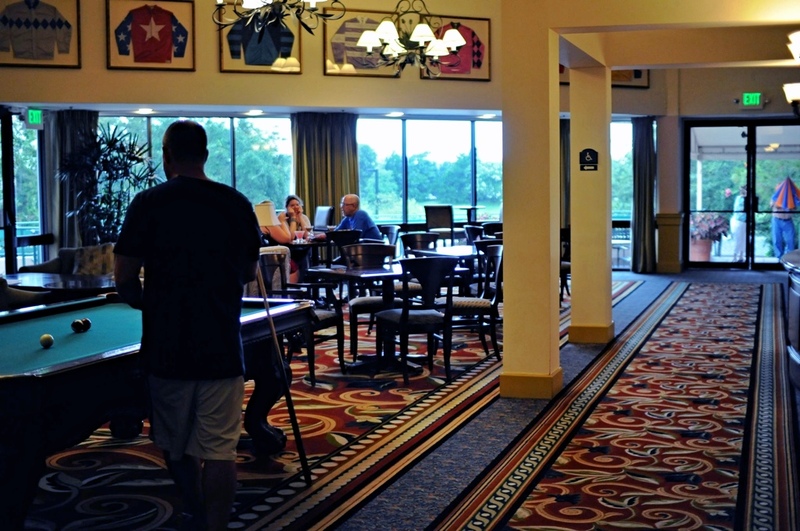 There were a lot of great recommendations but the one that seemed to come up the most was The Turf Club at Disney’s Saratoga Springs Resort and Spa. It was actually where I thought I might go even before asking for suggestions so it seemed meant to be. A couple friends decided to join me so that we could have several dishes to sample. The things I do for work! 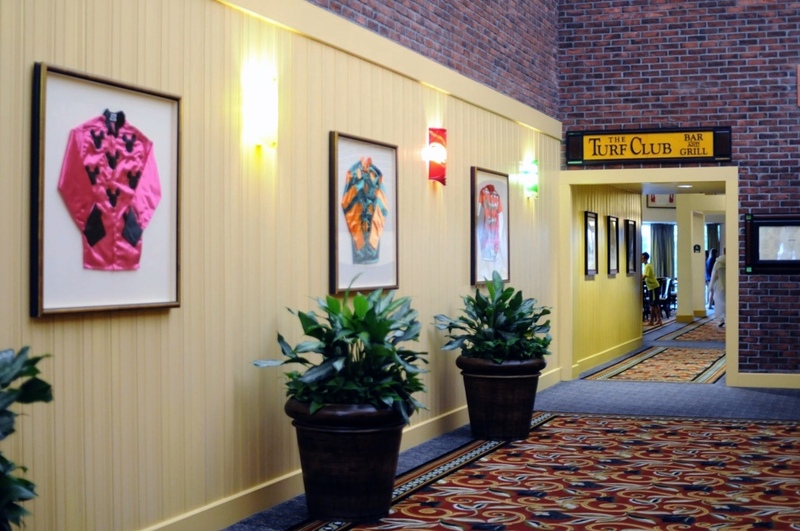 The Turf Club Bar and Grill is an indoor/outdoor restaurant at Disney’s Saratoga Springs Resort and Spa. 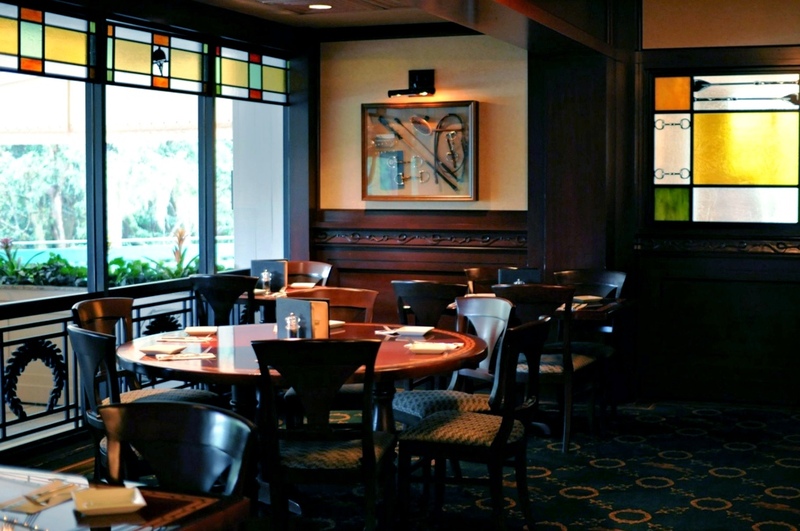 Overlooking Disney’s Lake Buena Vista golf course and Downtown Disney, the casual restaurant takes the equestrian theme of the Disney Vacation Club resort. 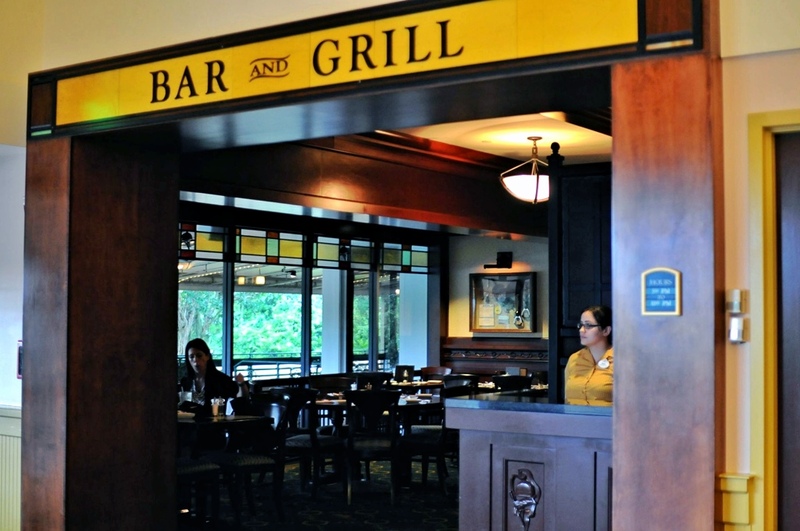 Open to the public, not just DVC members, the Turf Club Bar and Grill currently serves dinner only. There are two ways to enter The Turf Club. 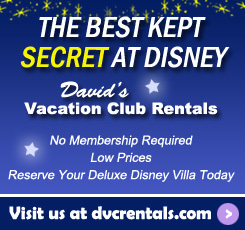 The most common way is to enter via the Carriage House. From the lobby, walk past The Artist’s Palette to the hallway at the end of the building. Turn right to go through the bar area of the restaurant where there is a pool table, a nice sitting area by the TV and several tables with chairs. At the far end of the lounge are two glass doors that serve as the second entrance to the restaurant and bar. This entrance is accessed from the parking lot on the back side of the building. If you are driving, after you pass by the security gate follow the signs to The Turf Club or the golf course and you will come to this entrance. 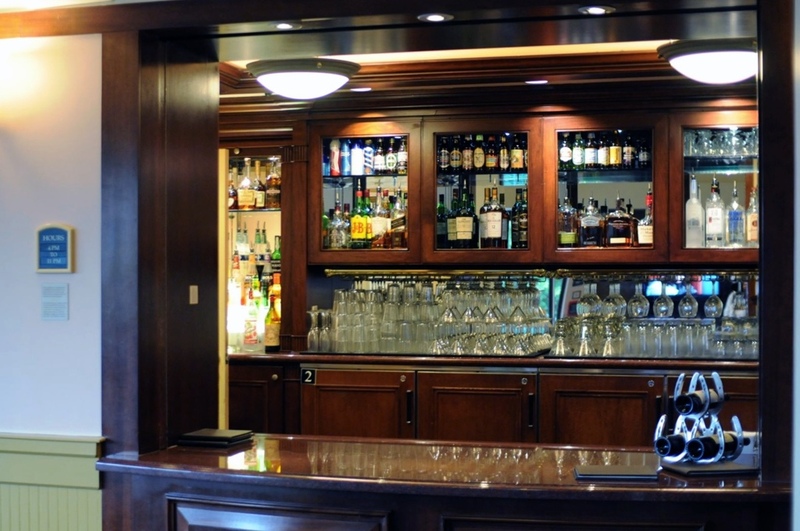 The bar is a small, walk-up window bar. In addition to ordering from the standardized drink menu that Disney now has in pretty much all of its bars and lounges, you can also order most any common drink here. Between the bar and the back entrance is the restaurant. Here at the podium is where we checked in for dinner. Inside the restaurant, dim lighting and wood-paneled walls create a sophisticated ambiance. 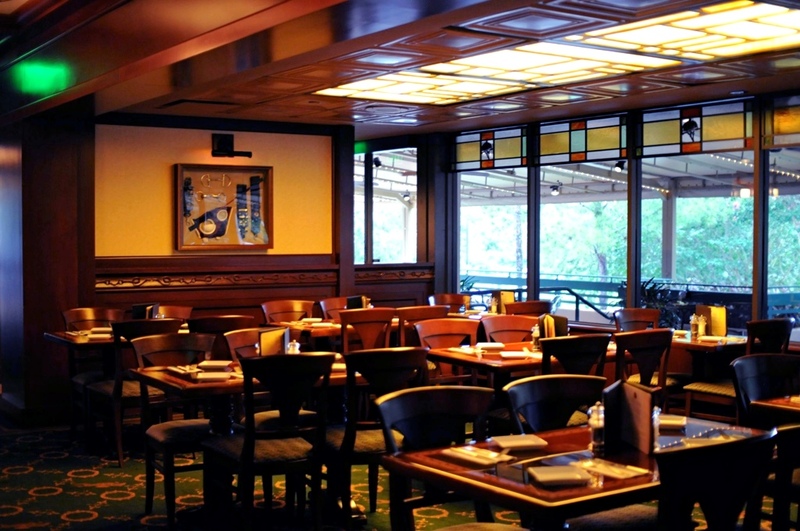 The overall theming of The Turf Club is understated compared with most Disney themed restaurants. 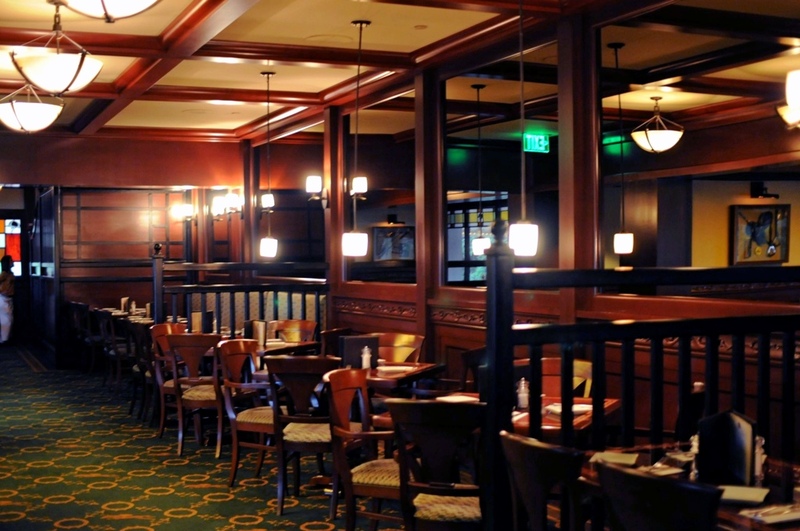 It’s designed to be reminiscent of a racetrack clubhouse in Upstate New York at the turn-of-the-century. The restaurant is decorated with vintage equestrian memorabilia: photos of jockeys and their horses, antique riding gear and racing articles of yesteryear. The theme is carried through to the stained glass windows and cherry wood molding which are decorated with riding crops and bridles. 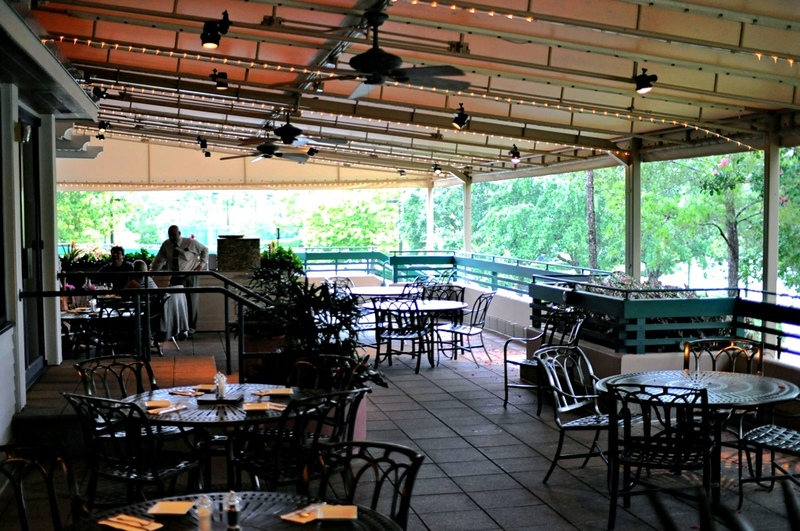 Outside, a spacious covered patio overlooks the golf course and Downtown Disney for al fresco dining. Is has a nice wide covering, making it an ideal place so sit out of the sun or rain. 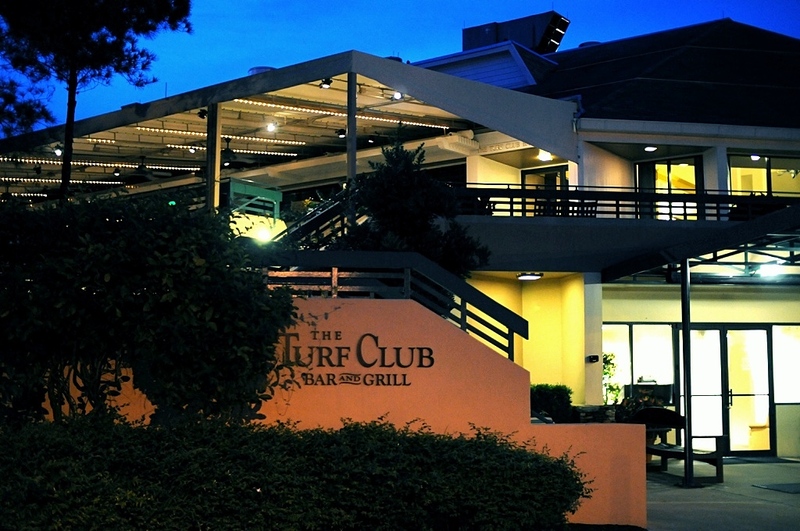 The cuisine at The Turf Club is American, with steak being what they are most known for. I have dined there a few different times over the years and have always liked the food in the past so I was looking forward to my meal. I have to be honest, this time it fell a bit short of my expectation. If it had been just me I might not even mention what I didn’t like, but the consensus at the table was that it could have been better with just some minor changes. None of the food was so bad that we would send it back, but nothing knocked our socks off either. Since I have had delicious meals there in the past I’ll chalk this one up to a bad night and definitely give it another try in the future. In addition to the two appetizers that we tried (listed below), the menu also includes Crab Cake, Tomato Bisque, Steamed Mussels, Buffalo Chicken Dip, Grilled Romaine Salad, French Onion Soup, Onion Rings with Dips, and a Chef’s Seasonal Salad. 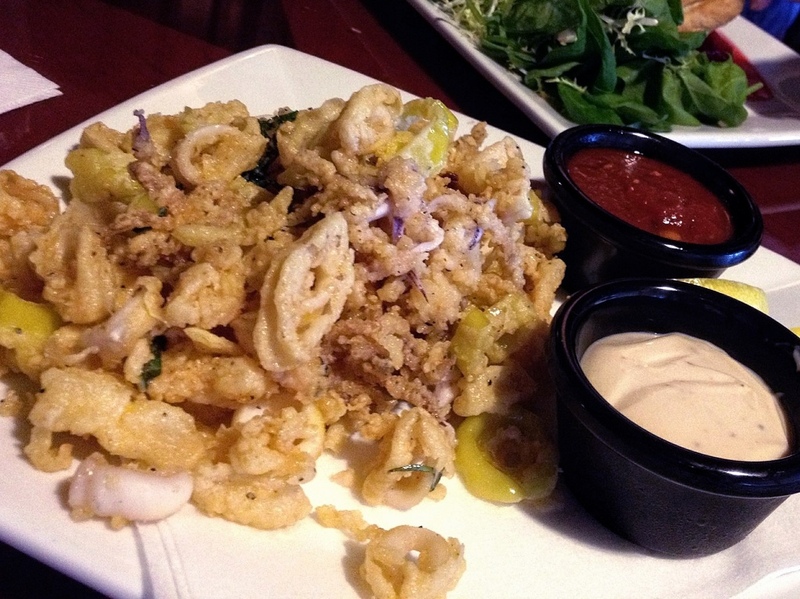 Calamari is one of those things that can be hit or miss at any restaurant you might go to. When it’s a hit, it is one of my favorite appetizers, but more often than not, many restaurants struggle to get it right. I’d say The Turf Club fell right about in the middle that evening. The calamari wasn’t melt-in-your-mouth tender, but I wouldn’t say it was exactly tough either. It was ok. One nice surprise were the fried pepperoncini rings that were mixed in. I liked the tangy contrast that they added. The second appetizer that we tried was the Baked Brie. From the description on the menu, we expected the cheese to dominate the plate with a little salty Prosciutto and sweet preserves on the side to balance the flavors. 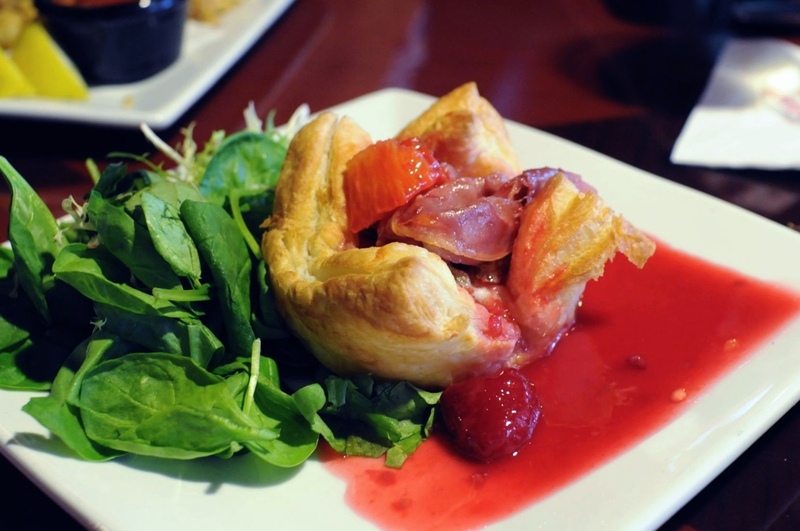 It sounded delicious – in fact, you’d have to really work hard to make me not like Baked Brie. I did like that it came in puff pastry but the pile of undressed greens on the side didn’t really add anything other than color. The preserves were more of a fruit syrup than preserves and unfortunately that is what dominated the flavor on the plate. 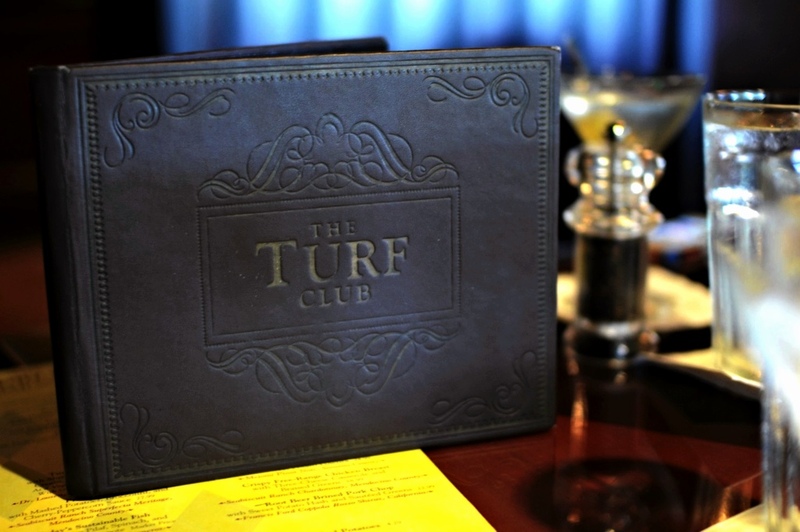 The entree offerings at The Turf CLub include Prime Rib, a Sustainable Fish option, Grilled New York Strip (gluten-free option), Mint-crusted Lamb Chops, Root Beer Brined Pork Chop (gluten-free option), as well as the entrees below that we ordered. A side dish of seasonal vegetables and/or mashed potatoes can be added to any entree at an additional cost. This was one of three gluten-free entrees on the menu. 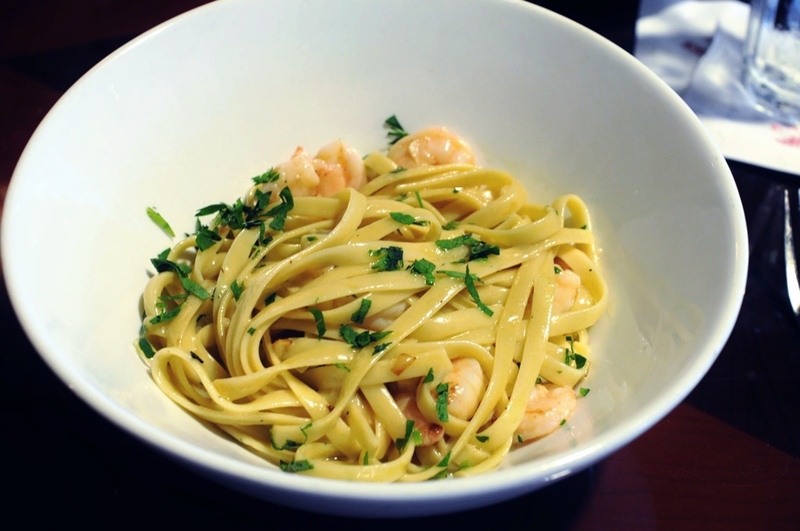 It was a simple, clean dish that was very light. The salmon was quite mild. Even though the menu mentioned that the it was a corn-asparagus salad, my friend was surprised at just how cold the salad was. 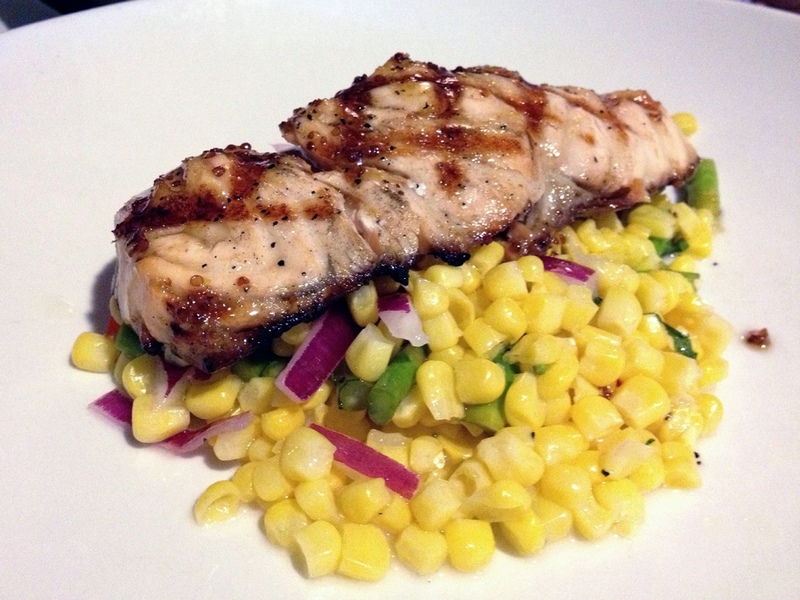 It might have been better at room temperature since the salmon was placed on top of it. With this entree we were again surprised because it was very different from what we imagined based on the menu description. 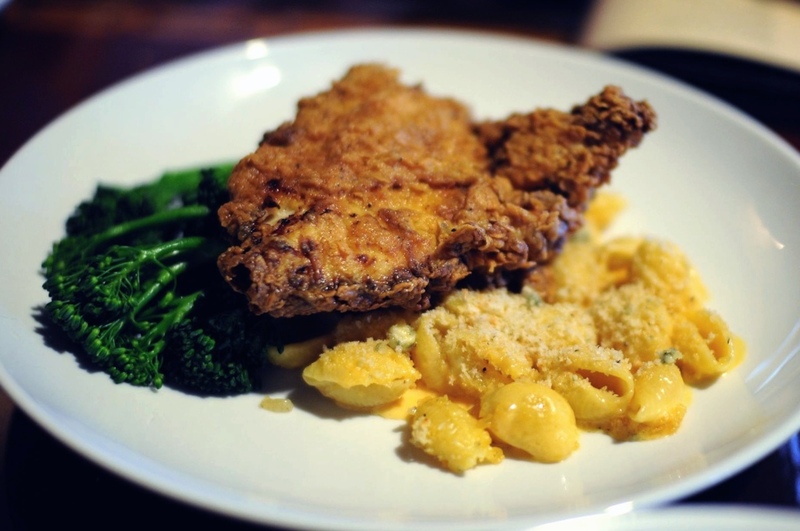 I probably would have called this Fried Chicken with Mac n’ Cheese. Again, it was fine, but nothing to write home about. One thing to note is that there was no problem substituting Broccoli Rabe for the Greens. We all agreed that the entree I ordered was the best of the bunch. In fact, it was probably the best thing that we ate that night. The pasta was done very well. I like it al dente and this was perfect. The shrimp was tender and plentiful. The sauce, although more buttery than creamy, did have nice flavor. 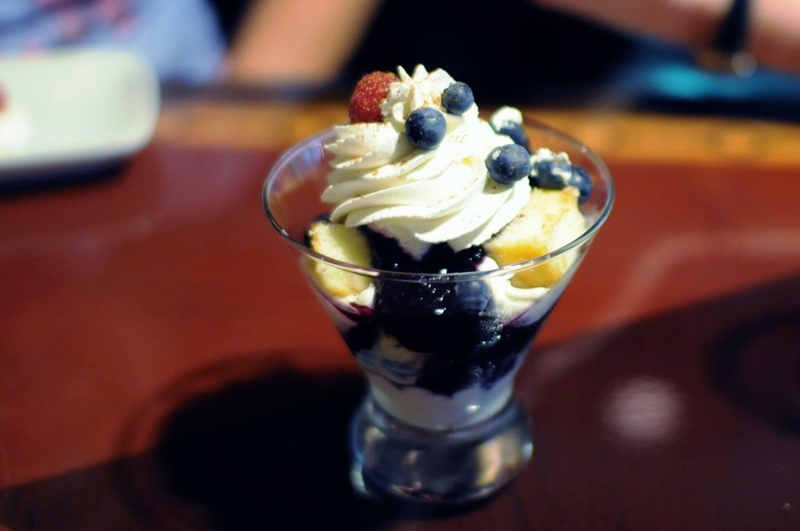 Now for everyone’s favorite part – dessert. In the name of research, we felt we had to try three completely different desserts. They also had a Warm Seasonal Fruit Crisp, Chocolate Espresso Torte (Gluten-free), and a Sorbet Assortment. 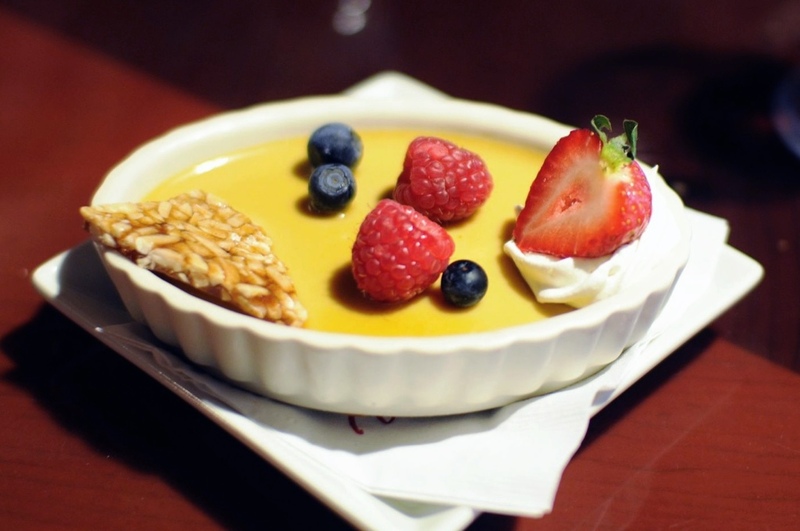 I’m a big fan of pudding, flan, creme brulee, and other such creamy desserts – especially when they are light and silky, and just slightly sweet. If you like a thicker, sweeter, more dense version of this kind of a dessert, then this one is for you. The maple flavor was prominent throughout. My friend’s favorite part was the almond praline. 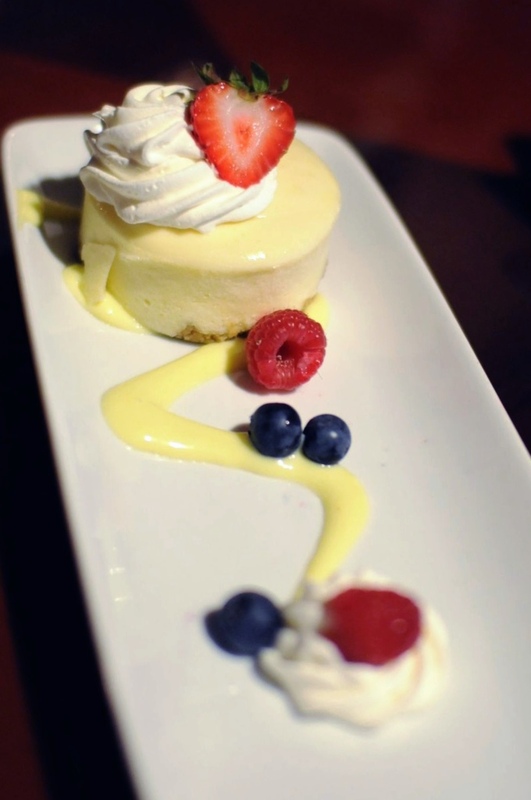 Honestly, I can’t remember anything specific about the cheesecake, either good or bad. I think it was fine, but we liked the next dessert so much more that we didn’t eat much of the cheesecake. We all liked this one best! It was a really good, not-too-sweet dessert that I would order again. The menu description was spot-on. We got exactly what we thought we were getting. It was the one thing on the table that we completely finished. 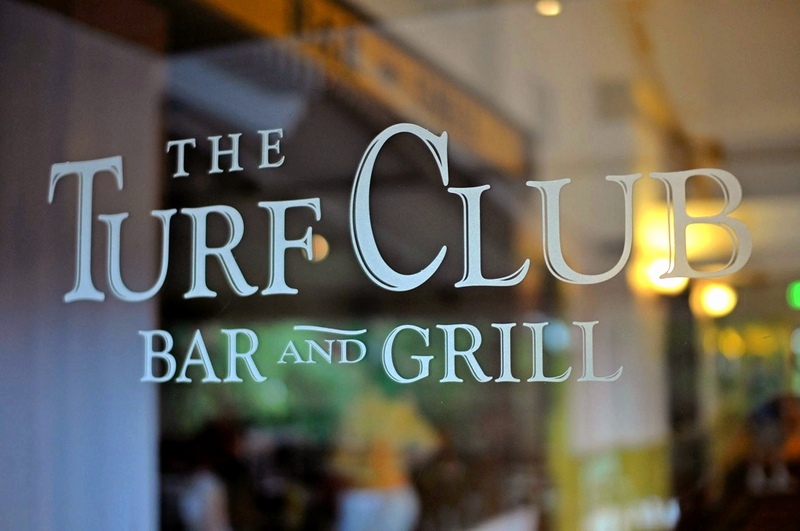 I really wanted to come away from this meal being able to say that The Turf Club is a hidden gem that everyone should put on their must-try list. I was disappointed that that wasn’t the case. In researching this article I came across many instances of people singing the praises of this restaurant, and equally as many mediocre reviews. I, myself, have enjoyed excellent meals there in the past. Perhaps it was just an off night. I’ll be giving it another try and I think you should as well. Let me know what you think when you do.